I see Microsoft has just released a security update for the Lync 2013 Client (kb2881013) which appears to be the Lync-specific fix under the MS14-036 security bulletin umbrella (and which is why clicking the kb’s link takes you to the bulletin’s page). 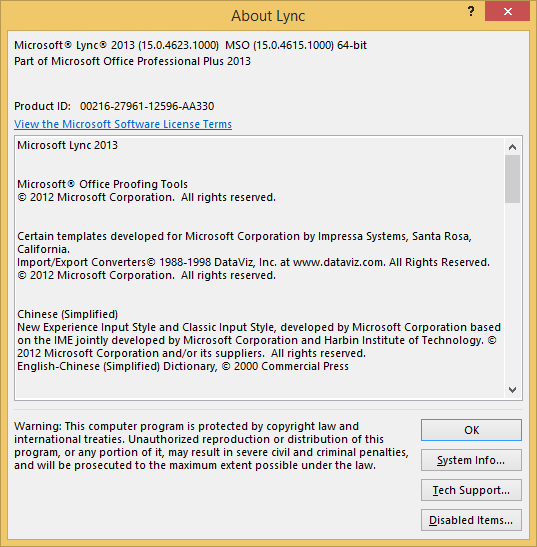 This update takes the Lync 2013 Client to 15.0.4623.1000. 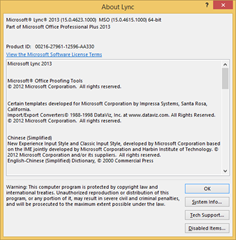 "This security update resolves a resolves a vulnerability in Microsoft Lync that could allow information disclosure if a user opens a specially crafted Lync meeting request." If you install this update, users of Outlook 2007 and and Outlook 2010 will no longer be able to see (or call) the numbers of their Outlook Contacts. Microsoft is aware of this and offers two work-arounds: edit the Contact to remove their e-mail address, or change the user’s CsClientPolicy to set “DisplayPhoto” to “NoPhoto”. Bounce the clients, wait for a contact re-fresh/re-synch and all will be well – just a bit clunky without the photos. This has been fixed in the August 2014 update – at least for Outlook 2010. * The MSO pre-req kb2878316 appears to be the Office 2013 fixes under the MS14-023 security bulletin umbrella. I exited Lync on my x64 Win 8.1 machine before applying any updates and the process required no reboot. Here’s a before and after comparison of my client on a Windows 8.1 machine. [This post was edited significantly on July 1st, replacing the earlier interim post while I was on leave overseas].